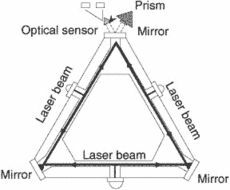 A gyro in which two laser beams travel in opposite directions over a ring-shaped path formed by three or more mirrors; rotation is thus measured without the use of a spinning mass. Also known as ring laser. Three mirrors are mounted in a triangular fashion. A beam of coherent light is reflected by these mirrors should the assembly rotate in the same direction as the beam. The frequency of the beam will increase and the converse will take place in the reverse direction. The change of frequency is a measure of rotation of the assembly. In actual practice, a second beam is sent in the opposite direction. The frequency difference between these two beams gives the angular rate of rotation of the table. A highly accurate way to measure change in an angular position or angular rate without the use of any mechanically spinning wheel. The ringed laser gyro—principle is based on the small frequency difference produced between two laser beams traveling in opposite directions. When the gyro is rotated, the frequency difference is measured and the data processed to determine the angular velocity with very high accuracy. The main advantages of a laser gyro are that there are no moving parts; there is no warm-up time, and there is a high long-term stability and rate capability. They are insensitive to acceleration and provide fine resolution over a full dynamic range. The redundant Navigation systems, very high accuracy Ring Laser Gyro based Inertial Navigation System (RINS) and the most modern and accurate Micro Navigation System (MINS) had ensured the missile reached the target point within few metres of accuracy. Sigma 40 navigation systems are built around a ring laser gyro (RLG) inertial core, which guarantees sustained very-high-precision, coupled with a high degree of operational flexibility. It appears that the spacecraft suffered a double whammy: first the star tracker could not lock onto its correct guide stars, and then a laser gyro in Stereo B's Inertial Measurement Unit, which senses the craft's orientation, failed and started providing bad data to the attitude-control system. Under the contract Northrop Grumman will also manage various products and systems that it supplies, including the WSN Ring Laser Gyro Navigation system, AN/BPS-15/16 Radar Set Weapon system, Steering/Scalable Integrated Bridge System and SPQ-9B radar set items. Based on digital laser gyro technology with a long optical path, SIGMA 30 reflects SagemOs proven expertise in the production of navigation systems and inertial sensors. He highlighted the indigenous fibre optic gyro with integrated optic chip, wing laser gyro for inertial navigation system for guided missiles, handheld thermal imagers, and laser range finders etc. The navigation systems, very high accuracy Ring Laser Gyro based Inertial Navigation System ( RINS) and the most modern and accurate Micro Navigation System ( MINS) ensured the missile reach the target point within few meters of accuracy," the release said. For this purpose, a high accuracy laser gyro or rotary encoder can be used. The upgraded system is dubbed S19 L and uses a laser gyro and a new guidance processor. The installation of the systems, known as the LTN-92 Ring Laser Gyro Inertial Navigation System, or INS, is scheduled to be completed this fall with other installations still being negotiated. Sierra also added a Litton Guidance and Control LN-93 Ring Laser Gyro INS, a GEC Miniature Standard Central Air Data Computer, a new angle of attack system, and a video camera/recorder. Calling on a laser gyro core, they also feature laser technologies that guarantee sustained high precision, along with operational flexibility.